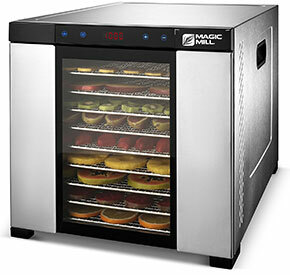 Dehydrators are the perfect home device for people who are concerned about eating healthy. These simple devices will produce healthy foods and snacks you can usually find in stores and supermarket. These foods are processed in a natural way, which means that they don’t have any extra sugar or salts added. 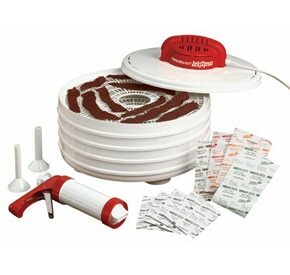 The food that was processed in a dehydrator can also be stored for a long time. These devices are not the cheapest, but the benefits they offer exceed their prices. You should always put your health in front everything else. Even though using these devices is pretty simple and straightforward, you should know that there are some things you have to stick by. Otherwise, you may end up with unwanted results, and your unit can stop working as it should. Here are the basic rules of food dehydration. If you’d like a ultimate list of foods that you might not want to or foods you shouldn’t dehydrate check out our Foods You Should Avoid to Dehydrate post. 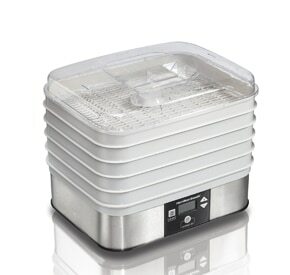 Combining herbs and fruits in the dehydrator is not a good idea because of the difference in smell. The fruit can absorb the smell of the herbs, which will spoil their flavor, making them unfit for cooking. The food you put into the dehydrator should be cut to similar proportions. Cutting the ingredients into uniform size will yield the best results because all the pieces will dry out at once. If the pieces are not of the same size, you will have to check on the progress all the time. If you put apples and bananas into the unit at the same time, you should also monitor the progress because they don’t dry the same. Keep an eye on the progress and take the fruit that’s dried first out in time. When you decide to dry food, make sure you dry foods of the same family together. Some fruits and veggies have to be dried on their own, while others can be combined. If an ingredient has a completely different taste and smell, don’t mix it with the other ingredients. For example, if you dry hot peppers and tomatoes, the tomatoes will end up tasting spicy. The same goes for garlic, onions, and other similar veggies. Ingredients with a strong aroma must be dried separately. Blanching the food before putting it in a dehydrator is a very good idea, but it’s not mandatory. If you decide on taking this step, know that the blanching process destroys the enzymes in the food, making it last longer when stored. The shelf life of veggies and fruits is drastically improved by blanching. The food also tastes fresher in case you want to rehydrate it later on. Blanching is done by boiling the ingredients for a couple of minutes and putting them in cold water after that. Placing the pieces correctly on the drying trays is critical. Make sure you don’t overlap fruits and veggies because it could interfere with the drying process, especially if your dehydrator dries the food vertically. The heat from the base won’t be able to make its way up at the same rate, which will dry your food unevenly. The dehydrating process will take more time this way. That means that they will use more power and increase your electricity bill. Make sure you place the trays with even spaces between them, and everything should work out just fine. Keep in mind that this device has to be used in a well-ventilated room. The drying process creates a lot of moisture. Sometimes the smell finds its way outside of the unit if the ingredients have a strong aroma. For example, drying hot peppers releases oils that can irritate your eyes if the room is not vented. The same goes for onions and other such veggies. Open the windows and make that air circulate before using this device. When you want to dehydrate fruit leather, don’t use sugar granules, honey or corn syrup works much better. The syrup will be absorbed by the ingredients, while the sugar only crystallizes on the outside of the fruit. The taste is there, but the cleaning process will be much harder if you use sugar. Lemon juice is great for food preparation before you shove it in the dehydrator, but it doesn’t work well with all food types. You should avoid using it with veggies that have a lot of leaves or if they are green. The citric acid from the lemons will turn their color into brown, and you don’t want that to happen. Before you put a food marinated in alcohol into the dehydrator, check the manual. Some manufacturers state that their devices can’t work with alcohol and that you should avoid it at all times. If you want your dried food to last longer, you need to store it in dry containers. The food lasts for longer after the dehydration process because it doesn’t have any moisture in it. If you don’t save it correctly and if moisture gets inside the containers, the food will spoil much quicker. Store everything in sealed plastic or glass jars. Also, make sure you check on the stored food once in a while, to make sure it is still safe for consumption. Get a couple of mitts before you remove a tray from your dehydrator because they can be very hot and you can hurt yourself. 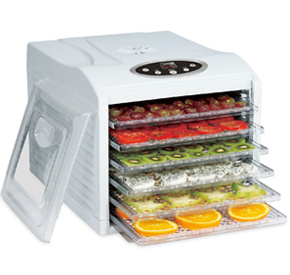 Having a dehydrator around the house is great because you can always make sure you’re stocked up with healthy foods. These simple tricks will help you get the best results and the tastiest dehydrated ingredients you can later use in your cooking. You’ll keep the flavor, but you will also get a much longer life with one of these devices.